Airplane Lavatories That Clean Themselves? Airplane lavatories. While most of us prefer not to ponder just how filthy they really are – the fact that they’re one of the most unsanitary places on a plane will come as little surprise. Boeing hopes to change that. 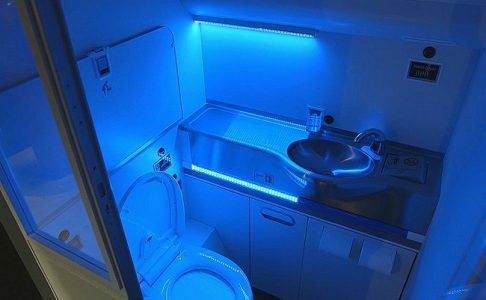 The U.S. plane manufacturer just announced it’s filed a patent on a prototype that uses ultraviolet (UV) light to kill 99.99% of all lavatory germs, in three seconds, after every use. Though the company statement says the “Far UV” light is not harmful to people, it would be activated only when the lavatory is unoccupied. Boeing engineers say this innovation can minimize the growth and potential transmission of micro-organisms. Boeing says the prototype would lift and close the toilet seat by itself so that all surfaces are exposed during the cleaning cycle. The design also incorporates a hands-free faucet, soap dispenser, trash flap, toilet lid/seat and a hand dryer. To read more at CNN.com, click here.